Welcome to the latest edition of your library newsletter. You are receiving this newsletter because you told us you wanted to hear more about the libraries in East Sussex. You'll receive regular updates telling you all about the latest goings across the Library and Information Service. If at anytime you don't want to receive these newsletters you can unsubscribe using the link at the bottom of this email. The Mischief Makers from the libraries have made a short video to tell you how the Summer Reading Challenge works. The Challenge, helping children to keep reading during the summer holidays, has already started in our libraries and you can sign up to the challenge online. Watch the film on YouTube and see if you can spot the film references! Take up to 10 eBooks away on holiday with you, just visit our eBooks site, download the Libby app and log in with your library card and PIN. With thousands of titles and new ones added daily there’s always something you’d like to read. Check out the new eBook titles we’ve added recently and get reading. And, if you read more than you planned you can checkout more eBooks from anywhere in the world. There is so much going on in our Libraries over the summer, from sessions helping people develop their digital skills and get more out of the internet, to learning how to care for and interact with dogs, with the Dogs Trust. Check out the variety of activities on our community information database, ESCIS. ESCIS lists lots of local events, including those in libraries. Pop in your postcode and see what’s happening near you. Big Ideas have never been so much fun! In the near future Charmaine and Stan are down on their luck and living in their car. In desperation they sign on for life in Positron; a privately funded postmodern prison – where everybody must serve a month as an inmate and a month as staff. Life is like a 1950s American small town stereotype but on change over day you go to jail! What follows is screwball comedy, bedroom farce, prison-break thriller and a 60s crime caper. 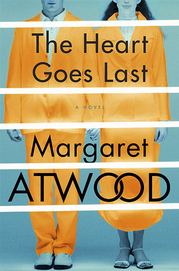 The Heart Goes Last was the 2015 winner of the Kitchies Red Tentacle Award for most progressive, intelligent and entertaining speculative novel. Reserve The Heart Goes Last and it pick it up from any East Sussex Library, or download the e-book now.